It was pretty ugly outside when I took these photos so they didn't come out as well as I would have liked, but I don't think any type of weather could take away from how absolutely adorable this dress is. This is another borrowed piece from Ashley via Flock Together, and I'm completely smitten. The polka dots, the full skirt, the square neck (which I realize you can't see, but ignore that)... it's just perfection. In fact, I'm pretty sure I'm going to get multiple outfit posts out of it before I send it back. I actually wasn't expecting to be sent this dress at all. I had commented on one of Ashley's posts a little while ago about how much I loved this dress and hinted at how I'd love to borrow it. Much to my surprise, I opened up a package from her last week only expecting to find one of my dresses I had borrowed, and found this one along with it. Basically what I'm trying to say is that not only is Ashley one of the most stylish bloggers around, but she's also one of the sweetest. I'll never get over how lucky I am to be friends with all of these amazing girls across the country. As for the rest of the ensemble, I'm disappointed that these lavender flats almost never come out the right color in photos. It's a little frustrating, but as long as everyone knows they're lavender, then I can least feel better about myself, right? Besides talking about cute dresses, I'm officially on spring break! I'm spending the week at my brother's house relaxing, catching up on sleep, watching "House of Cards" finally and playing with my niece and nephew. Jenn was also kind enough to let me borrow her tripod, so I'm hoping to finally get outfit posts of all of the things I've worn lately but haven't been able to capture. It's pretty much the most exciting spring break ever. Also, my camera batteries died while I was taking these (again) which is why I didn't get any detail shots. I don't know why this is always an issue with me. As for the tripod, that was probably one of the best things I purchased! I felt bad dragging my husband to take pictures after a long day so now I take almost all my pictures by myself. I hope you're having a great spring break (and I wish you were coming to Cali!!!)! So adorable! I live for polka dot dresses, I think I have about 5 and counting. They pair so well with so many things! Love it with the lacy cardigan, such a sweet look :). could you seriously be any cuter? love your style girl! I would love to feature you as my March blogger of the month I will send u an email. Have fun on your spring break Elana! And I saw the preview photo of this outfit on Instagram - I couldn't wait to see the actual post once I got home haha. Love the lavender flats with this super sweet dress! This dress looks so lovely on you! I think the print is gorgeous and whimsical and reminds me that spring needs to come asap. This dress is the cutest!! Polka dots are always always a win in my boook. Also, the color of your hair is amazing. Also, I starting watching house of cards + really loving it. Also, I can't wait for you to come to CA, we're having so many adventures. Woo hoo for spring break! I'm on mine too. 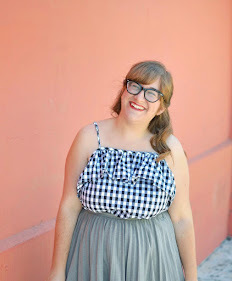 Do you know Ashley from California, or did you meet through your blogging endeavors? Why cant I get into house of cards? I can't do it. It just is so...I dunno. I can't pay attention to anything anymore really though. I love your dress! I remember seeing it on Ashley - and it's equally adorable on you. Those lilac flats are so cute too - I hate pastel things they are so hard to get true to color. This dress looks so fantastic on you!! i love the polka dots and how you styled it for cooler weather. Absolutely perfect, you look so adorable. Don't you hate when it's overcast/batteries die? It's like the blog gods don't want you to get your photos done! Yay for Spring break!! I still have a couple weeks until mine.. That is super nice of Ashley to surprise you with this dress! It looks darling on you! I love the cardigan and even though the flats don't show up how you want them to I still love them and that they're lavendar! This dress looks so amazing on you! Ashley is the sweetest and I think the shoes are a nice touch, but I know what you mean. Whenever someone mentions the wrong color of a piece, I'm like "NOOOO! why would I wear that with this?" But I think you can definitely tell. Aww this dress looks perfect on you, how sweet of ashley! I love your lavender flats but could see how the pale color would be hard to capture in pictures! Have an amazing spring break! Um, this is one of my favorite dresses of yours. LOVE the polka dots. You look so adorable! Enjoy spring break! Thank you so much for your amazing comment on my blog! It really brightened my day a whole bunch and made me smile nonstop! You are so sweet! Oh my gosh, this dress with this cardigan? Adorable! I love how the lace on the cardigan echos the polka dot pattern on the dress, it's just so sweet and romantic looking. Overcast days aren't the funniest but they do make for great picture day! (No overly bright sunlight or squinting!) I actually think the overcast day really worked for you in this photos, there's a very quite, mysterious look to the photos. LOVE this dress! And ha I always think those shoes are adorably perfect and WHITE but lavender is even better! Oh so sweet of Ashley! & i couldnt agree more, it's been so awesome to get to know so many of you adorable AND sweet gals! love that dress and the shoes do look white but darling all the same : ) hope you had a wonderful spring break! did you stay in town?